Condition: Hardcover, no dust jacket. Very good. Fading to spine. 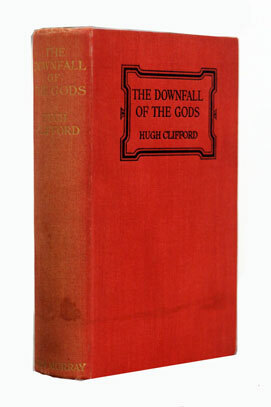 Written by Hugh Clifford, Governor of the Straits Settlements and British High Commissioner in Malaya from 1927 until 1930, The Downfall of the Gods is a historical novel about Angkor Wat. 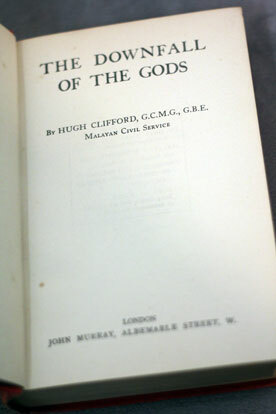 Clifford imagines how the medieval Angkor empire was defeated, and subsequently submerged in history, speculating on the possibilities of invasion and anarchy. “And here (in Angkor), alone in this ancient sanctuary, watching the dying day, I pieced together from the fragmentary knowledge, which the research of others had furnished to me, this story of the Downfall of the Gods. Hugh Clifford intended to follow his father, a distinguished colonial general, into the British Army, but later decided to join the civil service in the Straits Settlements, with the assistance of his relative Sir Frederick Weld, the then Governor of the Straits Settlements and also the British High Commissioner in Malaya. He was later transferred to the British Protectorate of the Federated Malay States. Clifford arrived in Malaya in 1883, aged 17. He first became a cadet in the State of Perak. During his twenty years in Perak, Clifford socialised with the local Malays and studied their language and culture deeply. He served as British Resident at Pahang, 1896–1900 and 1901–1903, and Governor of North Borneo, 1900–1901. In 1903, he left Malaya to take the post of Colonial Secretary of Trinidad. Later he was appointed Governor of the Gold Coast, 1912–1919, Nigeria, 1919–1925, and Ceylon, 1925–1927. He continued to write stories and novels about Malayan life. His last posting was as Governor of the Straits Settlements and British High Commissioner in Malaya from 1927 until 1930. He wrote Farther India, which chronicles European explorations and discoveries in Southeast Asia.